ProPublica report: Ivanka Trump and Don Jr. nearly indicted for real estate fraud. 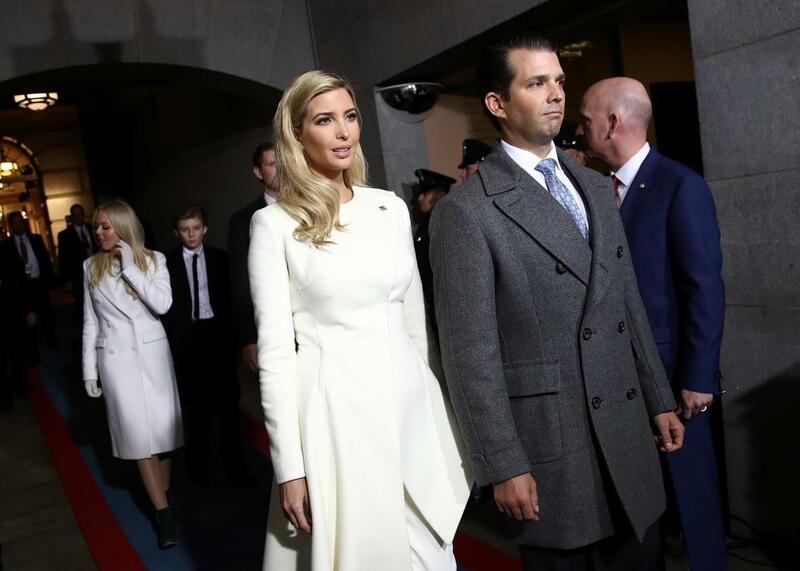 Ivanka Trump and Donald Trump Jr. arrive on the West Front of the U.S. Capitol for the inauguration on Jan. 20. The Trump SoHo project was unveiled by Donald Trump himself in 2006 and was supposed to herald Ivanka Trump and Donald Trump Jr.’s arrival at the grown-ups table at the Trump Organization. The half-baked development project, however, faltered badly from the start and left the two Trump children scrambling to fill the building’s condos to make sure the deal didn’t go kaput. To save their first signature deal, the two then-twentysomethings engaged in sales behavior of such dubious legality that, in 2010, the Major Economic Crimes Bureau of the Manhattan District Attorney’s office opened an investigation into Ivanka and Don Jr. The DA’s case against the Trumps was built over the course of two years, to the point where indictments appeared imminent. But then, as ProPublica, WNYC, and the New Yorker report, Manhattan District Attorney Cyrus Vance Jr. closed the investigation for good shortly after meeting with Trump attorney and one of Vance’s largest campaign contributors, Marc Kasowitz. From the outset, the particulars of the project were sketchy. The building wasn’t actually in SoHo, just nearby. Zoning laws wouldn’t allow for the building to be a residential tower, so the Trumps sold the project as a “condo-hotel” where buyers essentially purchased a hotel room, which, by law, they were not able to occupy for more than 120 nights a year. The Trump kids partnered on the project with two Soviet-born businessmen, one of whom was Felix Sater, who previously pleaded guilty to racketeering and had spent time in prison for a bar fight where he attacked a man with the stem of a margarita glass. With the economy in a deep dive in 2007 as the world careened toward the Great Recession, sales of the units were slow. To try to juice sales, the Trump kids started fudging the numbers. Business was slow, but the Trump family claimed the opposite. In April 2008, they said that 31 percent of the condos in the building had been purchased. Donald Jr. boasted to The Real Deal magazine that 55 percent of the units had been bought. In June 2008, Donald, Jr. and Ivanka, alongside their brother Eric, gathered the foreign press at Trump Tower in Manhattan, where Ivanka announced that 60 percent had been snapped up… None of that was true. According to a sworn affidavit by a Trump partner filed with the New York Attorney General’s office, by March of 2010, almost two years after the press conference, only 15.8 percent of units had been sold. In the end, the Trump SoHo “went into foreclosure in 2014 and was taken over by a creditor.“ Vance, who is still in office, told ProPublica, WNYC, and the New Yorker that he did the “right thing” by dropping the case, citing the civil settlement. He also said he plans to return Kasowitz’s money. *Update, Oct. 4, 2017: This post has been updated to reflect that three outlets collaborated on the story: ProPublica, WNYC, and the New Yorker.